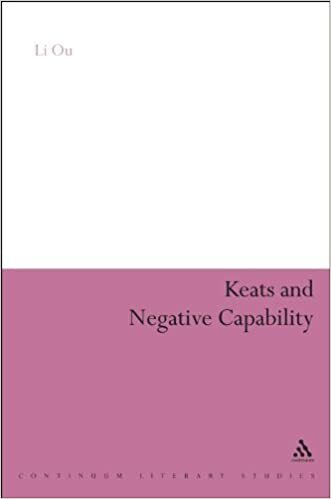 "Negative capability", the term John Keats used only once in a letter to his brothers, is a well-known but surprisingly unexplored concept in literary criticism and aesthetics. This book is the first book-length study of this central concept in seventy years. As well as clarifying the meaning of the term and giving an anatomy of its key components, the book gives a full account of the history of this idea. It traces the narrative of how the phrase first became known and gradually gained currency, and explores its primary sources in earlier writers, principally Shakespeare and William Hazlitt, and its chief Modernist successors, W. B. Yeats and T. S. Eliot. Meanwhile, the term is also applied to Keats's own poetry, which manifests the evolution of the idea in Keats's poetic practice. Many of the comparative readings of the relevant texts, including King Lear, illuminate the interconnections between these major writers. The book is an original and significant piece of scholarship on this celebrated concept.